In a small saucepan, add in the water, sugar, cinnamon stick, vanilla, ginger, cardamon pods, cloves, and black peppercorns. Bring to a boil, then reduce the heat and add in the teabags. Simmer for 10 minutes, uncovered. Pour the hazelnut chai into popsicle molds. Freeze for at least 6 hours, or until frozen. If you prefer a creamier texture, every 30 minutes for the first 2 hours, remove the popsicles from the freezer and stir the mixture to break apart any pieces of ice. 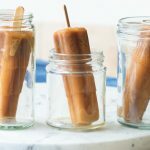 Get this recipe for Hazelnut Chai Popsicles (Vegan, GF, Dairy-free) at https://www.theworktop.com/breakfast-brunch-recipes/hazelnut-chai-popsicles/.